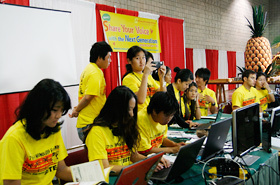 The “Share Your Voice Project” is an educational program between the Honolulu Festival Foundation and Kapiolani Community College. 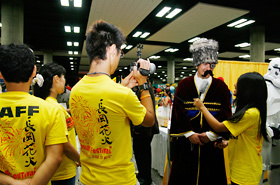 Its purpose is for the students to report on the attractiveness of the Honolulu Festival through their own experience to the world by utilizing live stream technology. 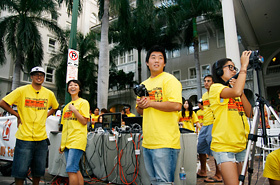 There were 38 students from Kapiolani Community College that participated this year. The scenes of the festival were live-streamed from 2 different locations unlike last year, which was done only from one location. In addition, the students utilized the social media such as Facebook and Twitter to introduce the atmosphere of the festival in Japanese, English and Korean. Also they interacted with the live-streaming audience. 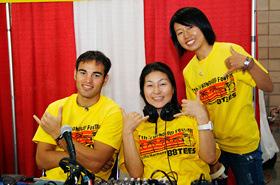 The students were stationed for the live-streaming for 2-days on Saturday, March 12 and Sunday, March 13, at the Hawaii Convention Center. 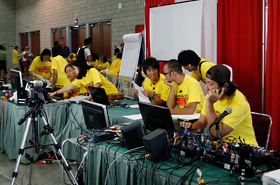 Their booth was fully equipped with electronic devices such as computers, mixing consoles and cameras. Each student was assigned to be an anchorperson, interviewer, cameraman, video switcher or sound man. All of them played their part as if they were producing a television program. 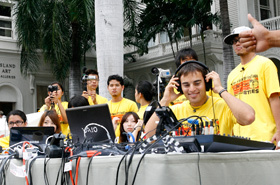 The videos were streamed in Japanese and English for many to see, which contained various performances and interviews with the guests and participating groups. The students looked a bit nervous before the event. Each student had successfully played their role. 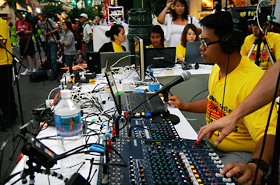 The students were in charge of everything, including anchoring the event and all of recordings. The students who were in charge of posting on social medias were also committed to working hard on the project. 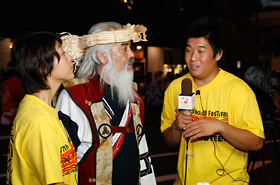 The small reporting team was organized which the reporters and interviewers go around the venue to find and report the amusement and attractiveness of the Honolulu Festival. 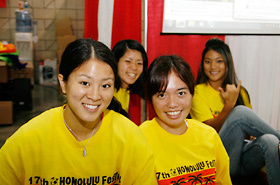 In addition, there were students that experience the Honolulu Festival for the first time. This was a great chance for them to effectively find the attractions and strategize on reporting based on their new experience. 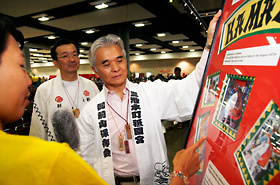 Furthermore, the Honolulu Festival is a place to introduce various cultures from the countries of Asia-Pacific region including Japan. 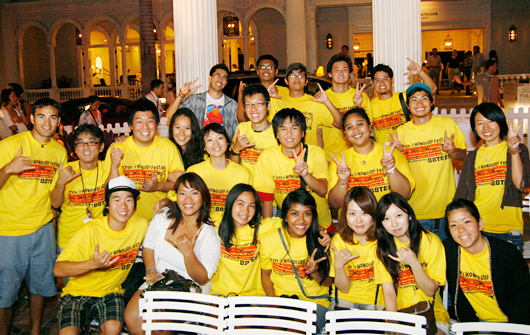 There were foreign exchange students from Japan. However, there were also many students that grew up in America which they showed curiosity in experiencing the Japanese calligraphy and Ennichi. After each experience, the students reported in details about what and how it is. The interview was conducted at the Anime Corner. The student challenged Japanese calligraphy and reported on their experience. The student interviewed the representative of the Honolulu Daijayama Booster Group from Omuta City, in Fukuoka Prefecture, which is a place where the Daijayama was first originated. 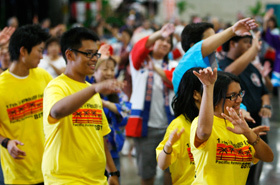 The bon dance was held for the first time this year at the Honolulu Festival. The Grand Parade was held in the afternoon on the last day of the Honolulu Festival on Kalakaua Avenue. The live streaming booth was set up in front of the Moana Surfrider, A Westin Resort & Spa, which is the same fine location as the VIP seats. Furthermore, the parade started from daytime to night-time which lasted for about 3 hours and a half. Everything was live-streamed online. The students got used to recording and editing videos as they experienced them for 2-days. They were being creative for the audience to enjoy the long show. In addition, they recorded the scenes in various ways such as zooming and switching cameras to avoid plainness which they also included interview footage in between the scenes. Moreover, this project required every student to think flexibly and work as a team which was successful this year. 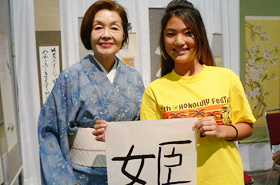 We would like to provide more opportunities for cultural exchange between the local communities and people around the world at the Honolulu Festival.